So this happened. Last week the stock market was percolating along with moderate gains on the back of positive economic news and earnings results. Then, on Friday (28-Oct-2016) FBI director James Comey released a letter to Congress indicating FBI investigators found additional Clinton private server e-mails. The new e-mails may or may not have any relevance to his prior testimony but, in an abundance of caution, Comey informed Congress. The DJ Industrial average immediately dropped almost 200 points. 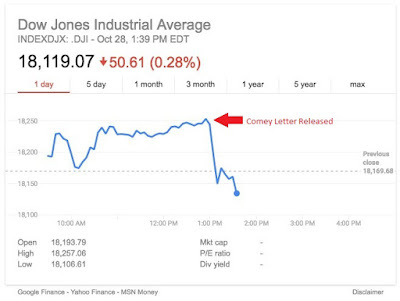 This NPR story was typical of business media coverage: "The Stock Market Stumbles After Friday's Clinton Email News." "Around the time that the email news broke, the Dow Jones industrial average plummeted from a peak of 18,255 to a trough of 18,097. That's not quite 1 percent, but the sharp drop, albeit small, is a sign of a broader storyline that has persisted through this election: that investors are scared of a Trump presidency." 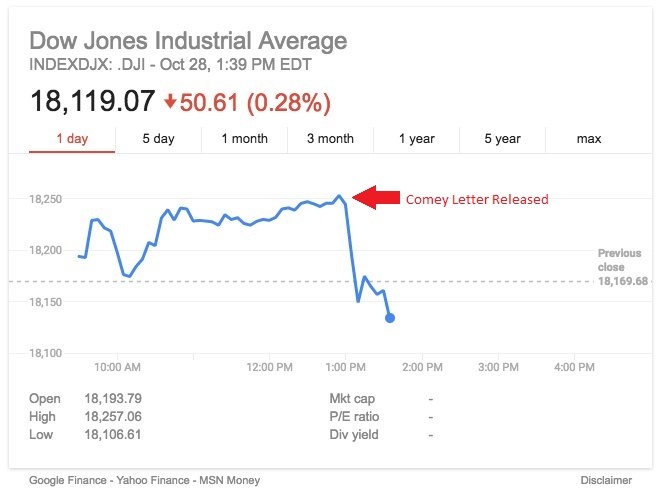 Partisan bluster aside, after it became apparent that breathless mainstream and social media reporting was less than meets the eye or that can be supported from the actual content of Comey's letter, the market recovered most of the midday losses. "It was a sharp move lower. 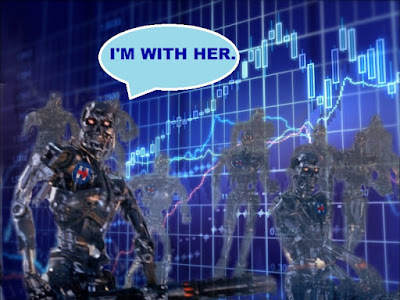 A lot of this is driven by smart algos that read the headlines and look for negative words because it went from plus four to minus five in a heartbeat on the S&P - it happened very quickly before you even knew it - and then you saw the headline." "If politics - or who wins - was that significant...and it's hard for me to imagine that Comey is doing all this for something insignificant... Having said that, stocks are up a little bit now, the VIX moved a little bit but it's very low, interest rates moved a few basis points... so the first thing I'd bring up is - we can talk about how politics may effect the markets, but when such a surprise hits us... and the market moves are not really that big... what does that say about both candidates and where markets and the economy may be?" The Dividist has opined on the notion that "Investors Love Divided Government" since 2006. We've repeatedly concluded the partisan makeup of the federal government has little or nothing to do with the equity markets long term. Short term is another matter. If markets believe that divided government matters to the stock market, then anticipation of election results can certainly drive short term, self-fulfilling prophecies in market movement. "Over the long or medium term, we do not think any attempt to correlate political parties in power and stock market performance should be taken more seriously than the Hemline Index or the Super Bowl Indicator. The reason is simple. The federal government does not and cannot control GDP, private employment, corporate profits, and/or the stock and commodity market as much as presidents or presidential wannabes would like us to believe. But short term market effects around the catalyst of an election are a different story. Investor psychology and emotion (whether driven by fear or greed or both) can certainly drive market movement in the short term. If a preponderance of investors believe that divided government is good for the markets, than it can become a self-fulfilling prophecy. " The difference this cycle, as exemplified by Friday's market action, is that high speed algorithmic trading means "short term" is now quantified in milliseconds. But algorithms are programmed by humans. They are coded with the intent of getting a short term trading advantage over human traders and other trading algorithms. 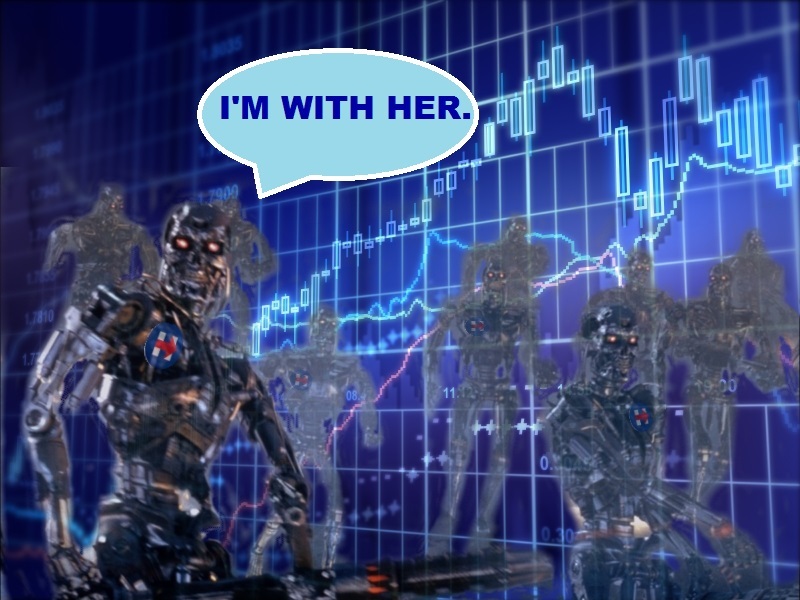 So, if algos are reading headlines on the election to gain millisecond trading advantages (as Kevin Polcari asserts in the CNBC clip above), it means that an investor bias for a Clinton presidency and divided government are being hard coded into these algorithms. "The one thing that the business community loves across the nation, most of the time, is a stymied government. When that happens, it usually means no new regulations and onerous laws are being passed, no new programs are being created along with their new taxes. We are wallowing in laws in this country already. Gridlock means risks to businesses are reduced and, often, restraints to our freedom may never come to pass. Gridlock is better than malfunction or oppression. By design, our system of government should demand broad, durable majorities before it will permit major change. Since government competence is usually unattainable, gridlock and bickering may well be a good price to pay for opposing the transformers by tying their hands and stopping them from imposing more laws. Handcuffing Washington is usually a good thing, a big win. Valuable things are not so easily created but they are easily destroyed." Status Quo: Clinton wins and Republicans control Congress. A continuation of the current gridlock would probably mean less emphasis on trade issues and reduce the chances of tax reform. Either “Clinton wins” scenario would create a more certain political environment. Regardless of people’s opinions about Hillary Clinton, her economic policies are transparent and offer a measure of certainty. Donald Trump’s statements have been vague and inconsistent. Since financial markets tend to prefer clarity, we think equity markets would prefer a Clinton victory." Are Markets Voting For Clinton — Or For Divided Government? "At the same time that Trump's odds of victory were sinking, there was little movement in the overwhelming odds that Republicans will retain the House. In fact, the odds of a Democratic House majority actually slipped to 12% after Monday's debate, perhaps because bettors saw Trump's performance as not especially harmful to the GOP. The point is that to the extent that markets are higher this week because of likely election outcomes, they're rising because investors don't expect either party to be able to get much done." "Longstanding checks and balances in US politics have a way of muting campaign pledges. Additionally, opposing parties in the White House and Congress can make campaign rhetoric less likely to become policy reality. The current market-implied probability of divided government following November’s election is above any of the last four cycles. 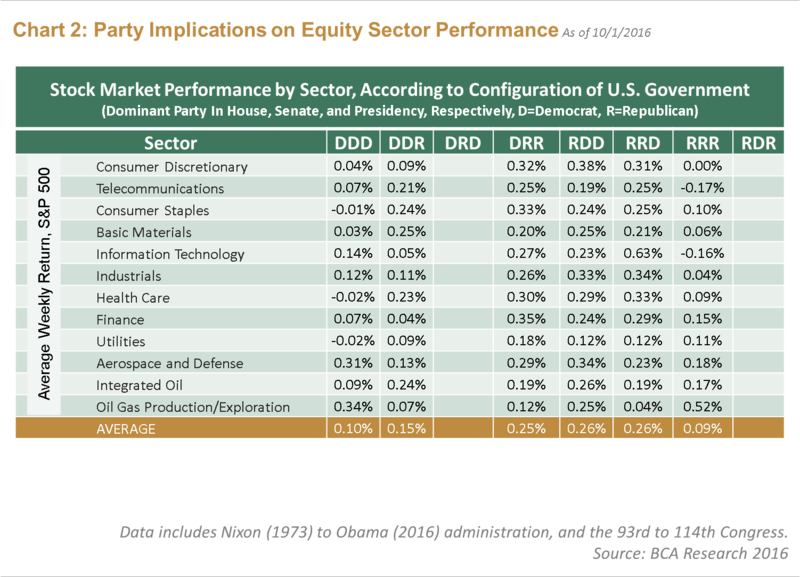 We believe divided government reduces the chance of seismic public policy shifts, although short-term politically induced market volatility remains our base case. " "Political gridlock sounds like a bad thing but for markets it can be the best outcome. Leaving businesses to get on with doing what they are good at, without political intervention is what investors tend to prefer. This is already evident in the correlation between changes in opinion polls and movements in the S&P 500. The equity market seems to favour Clinton over Trump but would be quite happy if she faced stiff opposition to some of her plans in a Republican-dominated Congress. Whatever the outcome, the end of uncertainty is almost certain to be good news for the stock market." "Stocks hate sweeping, sudden change. They love gridlock and governments tangled in bureaucratic morass (at least, they love it in competitive developed countries) because it reduces the risk of sudden, sweeping change. Stocks don’t really care who’s president. They’re neutral, objective, unbiased—just like investors should be when thinking about politics and their portfolio. Stocks simply care what presidents actually do—and are usually happy that they can’t do much." "Of course, politics is hardly the only factor driving the stock market. There's a lot more attention on the Federal Reserve's possible December rate hike and the deluge of corporate earnings. If anything, the political factor influencing the broader market is concern that Clinton will win AND the U.S. Senate or House could go to the Democrats. Investors prefer divided government, which leads to fewer changes in laws." "The long and the short for investors right now is to ‘wait-and-see.’ We would caution against making investment decisions ahead of the outcome of the election because of a political preference or influence, and if the outcome of the election is a divided government in any form, it probably means the political agenda promised during the election cycle won’t be what was expected when it comes to actual policy-making. If there is one vote investors should cast, it’s a vote for gridlock." Net net... If investors still love divided government, then high speed trading algorithms love divided government even more. "The “Goldilocks Outcome” hoped for by the Markets is a Clinton Victory in combination with the Republicans retaining control of Congress. If not the Senate at least the House. This will be viewed as being “just right”. Not too hot (Trump) and not too cold (total control by the Dems)." "So much focus gets placed on the president elect, but it is important to assess the likely overall composition of government post November 8. While the candidates talk about their grand plans—taxes, walls, deportations, etc.—history has repeatedly demonstrated that the checks and balances built into the Constitution are highly effective. A Trump victory coupled with a Republican House/Senate sweep implies a totally different governance outcome across all three branches of government than a split decision. 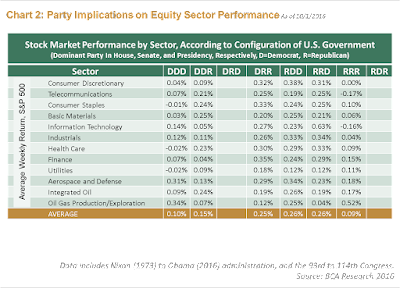 Implication: Asset markets are likely to view a divided government more favorably than a Republican or Democratic sweep. Interestingly, stock market returns have been better in a divided scenario."